The Copernicus Marine Service (CMEMS), led by Mercator-Ocean is based on a distributed model of service production, relying on the expertise of a wide network of participating European organisations involved in operational oceanography. 2. Thematic Assembly Centres (TAC), which are tasked with the collection of ocean observations, both in situ (water column) and satellite observations. 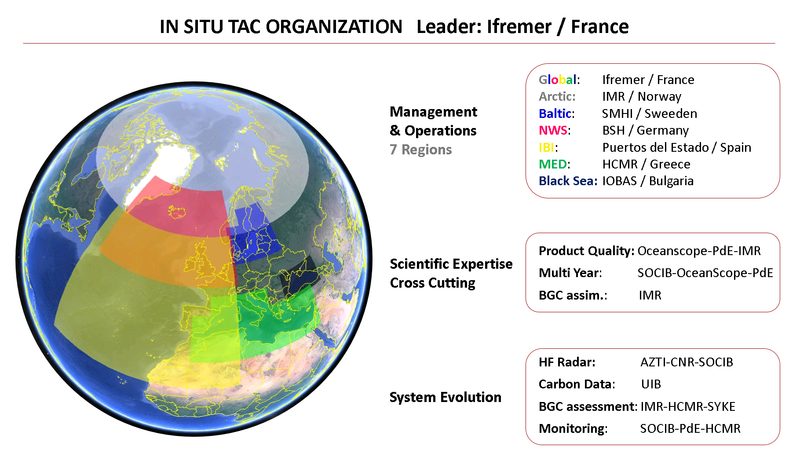 The In Situ TAC (General Presentation) is the component of the Copernicus Marine Service which ensures a consistent and reliable access to a range of in situ data for the purpose of service production and validation. 1. To collect multi-source, multi-platform, heterogenous data, perform consistent quality control and distribute it in a common format (NetCDF) and in near-real-time (within 24 hours) to the CMEMS Marine Forecasting Centres (MFC), for assimilation into their numerical ocean models. 2. To supply the MFCs and downstream users with re-processed 25-50-year products in delayed mode. In addition to the near-real-time products, these delayed-mode products are useful for model validation or assimilation in ocean reanalysis and climate studies.